Join us on Saturday, August 3rd at the Dana Adobe Cultural Center to see the nationally acclaimed cowboy entertainer, Dave Stamey,​ live in concert! Accompanying the western cowboy music will be a BBQ dinner and raffle. Gates open at 2:00 PM, while the concert starts at 4:30 PM. Make sure to bring a chair, blanket, and your dancing boots. Until May 1st, tickets will be on sale at a discounted price! Our early bird tickets are on sale for $45 per person. Tickets include the show, dinner, and 1 drink. Additional drinks can be purchased during the event. Join us for the critically acclaimed documentary concert, “Romancing the West” and an Italian dinner buffet at the Dana Adobe Cultural Center in Nipomo! The event will take place on Friday, June 21, 2019, at the Dana Adobe Cultural Center. Doors will open at 4:00 PM, while dinner and show starts at 4:30 PM. Until May 1st, tickets will be on sale at a discounted price! Our early bird tickets are on sale for $40 per person. Tickets include the show, dinner, and 1 drink. Additional drinks can be purchased during the event. Tickets can be purchased online, or by calling (805) 929-5679. 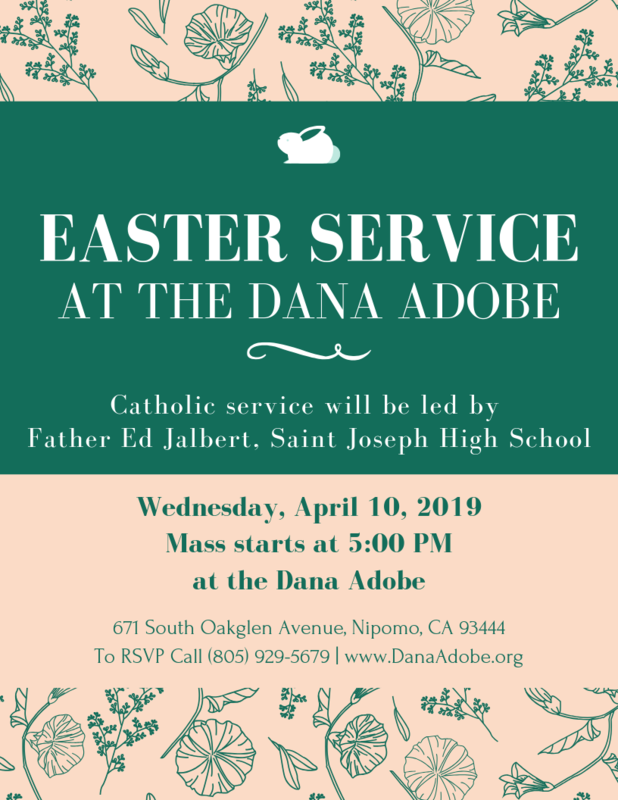 Easter Mass at the Dana Adobe will take place at 5PM on Wednesday, April 10, 2019. Admission is free to the public and refreshments will be provided. Catholic service will be led by Father Ed Jalbert of Saint Joseph High School. Please RSVP to (805) 929-5679.